Jakarta. 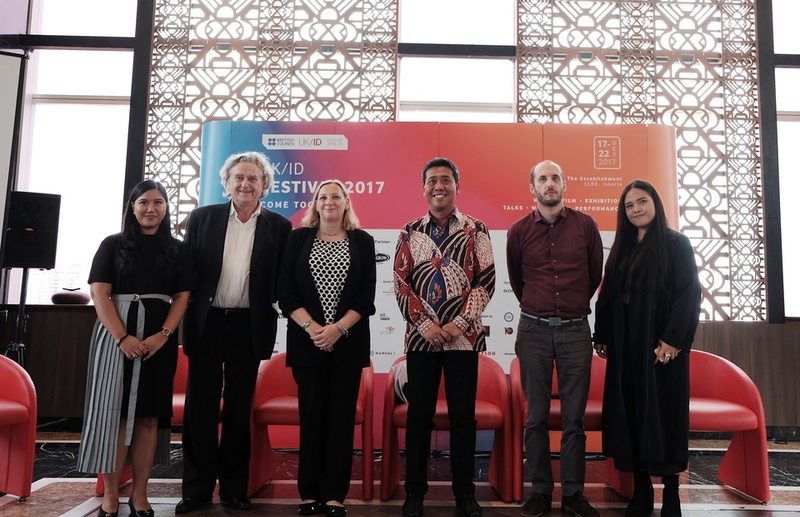 The British Council – as the education and cultural arm of the British Embassy – is set to host UK/ID Festival 2017 in Senayan, South Jakarta, on Oct. 17-22, following the success of last year's inaugural event. The festival forms part of the three-year UK/Indonesia 2016-2018 program, launched during President Joko "Jokowi" Widodo's visit to Britain in April last year, and it focuses on the creative industries. "One of the reasons he was in London was to promote his interest in the creative industries," British Council country director Paul Smith said during a press conference at Hotel Grandhika in South Jakarta on Wednesday (05/10). Juliet Maric Capeling, the British Embassy's deputy head of mission to Indonesia and East Timor, added that she was delighted that President Jokowi had made the creative industries one of his priorities because Indonesia's two main strengths are its cultural heritage and a creative, energetic population of young people. Besides the festival, the program also creates opportunities for artists to build connections through residencies, networking, cultural visits and collaboration projects. Smith added that the program is expected to result in knowledge sharing in the creative industries, as well as collaboration and co-production between creative people. Ahmad Mahendra, deputy director for international cultural diplomacy at the Ministry of Education and Culture, said the upcoming festival will benefit Indonesian artists to learn from Britain's flourishing creative industry. "This will provide opportunities for our artists to get more exposure, to cultivate partnerships with fellow artists from the UK," Ahmad said. The second edition of the UK/ID Festival will bring together 32 arts organizations and artists from Indonesia and 22 of their British counterparts for six days of various events, ranging from musical performances, film screenings, art exhibitions, live film scoring, to talk shows. Compared to last year's focus on technology, this year's theme is "Come Together" – a riff on a hit by the British pop group, The Beatles – meaning that it will be a medium for Indonesian and British artists and arts organizations to interact and celebrate the vast human, cultural and ecological diversity of both countries. According to Adam Pushkin, director of arts and creative industries at the British Council Indonesia, diversity is big in both countries, while Indonesia's national motto clearly states: "Unity in Diversity." "We're also presenting a side of the UK that demonstrates the kind of ethnic diversity there and the ways of people from different countries come to the UK and make the creative industries more vibrant," Pushkin told the Jakarta Globe. Whereas last year's monthlong festival was scattered across various venues in eight cities, this year's will be concentrated in The Establishment, a state-of-the-art multifunctional venue. "What we wanted to do this year was to bring many things together in one space," Pushkin said. He expressed confidence that the festival will still attract many visitors, considering Jakarta's large population. The festival will kick off on Oct. 17 with a screening of "England Is Mine," a biopic about Morrissey, the legendary English singer, songwriter and author, back in the 1980s when he still dreamt of stardom. The film was released in Britain in August. Right after that, the audience will be able to enjoy a live music performance by London-based Polish beatmaker Chloe Martini, in collaboration with Indonesian singer-songwriter Ratih Suryahutamy, who goes by the stage name Neonomora. "Chloe Martini's music is something I haven't heard before. It's electronic music, but the kind that's really unique, something that challenges me to want to rise up to that kind of music," Ratih said. Ratih's involvement with the British Council started last year when she was invited as one of the Indonesian delegates to The Great Escape Festival in Brighton, southern England, to network and learn from international music-industry players. "I was so happy there because it led me to have a UK tour this year," she said. There are many other events lined up for the UK/ID Festival. On Oct. 18, visitors can watch Alfred Hitchcock's 1927 silent movie "The Lodger," a live orchestra, which is a collaboration between Britain's London Fog and Indonesia's Sjuman School of Music, presenting a new score. Visitors can also see art works in the "First Dates" exhibition. One of the collaborative works to watch out for is "Kalpataru – The Tree of Life," a novel musical instrument made of objects that Surabaya, East Java-based experimental musician Uncle Twis found in a forest in western Scotland. Diversity as the theme is not restricted to ethnicity and culture, but also physical abilities. Sunday, Oct. 20 will be a day of inclusive ideas, which will provide opportunities for both disabled and able-bodied people to participate. Themed "Jakarta Unlimited: Sama Bisa, Bisa Sama," the series of events will include an audio-sensory 3-D painting experience known as bioskop bisik (whispered cinema); an art therapy session by Hana Madness; an inclusive dance workshop; poetry reading by Khairani Barokka; and performances by Candodance and Adrian Yunan. The festival is expected to end on a high note with a closing party called "Ring of Fire," featuring DJ Olushola Ajose, better known as Afrikan Boy, famous for fusing his experience as a Londoner with his Nigerian roots. Entrance to the festival is free, except for the performances by Chloe Martini and Neomora on Oct. 17 and another collaborative music performance by Dan Croll, Thearosa and Rock N Roll Mafia on Oct. 21. The full schedule is available on the British Council's official website.